Unfortunatly these things happen. As audiophiles we are all passionate about music and the devices we choose to listen through. I know at times I have had to "count to ten" before commenting on an attack of my observations. I think Steve Deckert handeled this one rather well. Audio really isn't a contact sport. An easy solution may be to bring a couple of different amps to Zenfest, level match them, and line 'em on Friday night. All Steve has to do is rename this amp "The King James Version Zen." It sure is righteous enough! The experience is considered " religious and enlightening "
There was once a time where "The Raw Meat Zen" would have suffice. In the meanwhile I am going to go back to a tubed CD player that will equal or surpass the previous two that I have done and it will be under a grand. Regarding the reason for this thread: 'the new amps' Way cool Steve, if I had the dough right now I'd go for it in a second. Not to flog a dead horse, but wow, such self-important arrogance coming from someone around this thread whose name begins with a "C". Heads so large on the outside are frequently shrunken on the inside. I have freakin' hard-edged opinions, also, but hopefully a sense of humility as to how they fit in context among folks I consider friends, and wish to continue in dialog with. Bottom line, Corey...right or wrong, showed poor taste in using this thread to express his opinions. With all due respect, Corey - this ain't the first time. In the "spirit" (can I use that word, or do you hold a monopoly?) of freedom of speech, we should all be allowed some tolerance, but considering your history on this forum, I think Steve's gracious forbearance is commendable. You're not the only member of this forum to enjoy a personal, if long distance relationship with Eddie, and you're doing no-one any favors with your comments or "quotes" in his name. Perhaps after you have invested as much time, sweat and blood as either of these two designers, your opinions as to the merits of their design philosophies or "compromises" might bear more credence. Or threads are shrunken. I posted to this thread to wake Steve up and my posting was not in vain. He went and deleted his remarks about his electrolytic capacitor/resistive filter amps and I respect that. I am now going to go delete my quotations of those remarks for future readers and more importantly, Steve. Gee Corey, Do you really want those bad things to happen to people that don't believe in the things that you do? A small aperture centered below the lower back! Hilarious until one of those small aperatures centered below the lower back heads up a theocracy and starts requiring everyone to walk their walk. (If I read Steve correctly) the new mono's ought to have more oomph with an 8 ohm single driver full range, yet still drive low impedances like the original se84's. It was said the trannies were the same. This interests me tremendously as I'm still very hooked on my Parker 98's, but am enjoying some experimentation with an fe126 in a blh. The Select does a very good job with the little fe126 at moderate volumes, but becomes congested at more demanding levels (unlike with the Parkers where the Select can play insanely loud before congestion and clipping). If I'm off center, perhaps someone can clean me up. Karl: How big is your room? I ask, because my Select drives these 126's plenty loud in my room, (24x13 w/ vaulted ceiling). You can overdrive 'em alright, but I never listen that loud. Steve's new amps are tres intriguing! Hmm, well the listening area here is 12' wide with a 7 1/2' acoustic tile ceiling for a length of 18', but beyond that, the ceilings go up to over 8'. There is no wall crossing the length-wise direction, however, and the listening area is open to the rest of the house. Yes, I CAN crank the 126's quite loud, but there are certain sorts of recordings that at a healthy volume have dynamic crests that can/will challenge the Select. It's usually classical recordings that have a great deal of overtone energy that press the dynamics. Close miked choral and piano with wide dynamic ranges come to mind, but also symphonic recordings. Wondering where the limits lie with the fe126's, I cranked some favorite Henry Purcell choral music (the anthems), and at "genuine life-sized" volume there is noticeable compression at various high points that I wouldn't experience with my Parkers. It's quite a bit easier to find the headroom limits of the Select with the fe126 than with the Parker 98's. With the Parkers, your ears have to BLEED first. Still, the Planet 10 modded fe126's are very surprising in the frugel blh with the plain ol' Select! The limits I've suggested would only occasionally be a drawback. 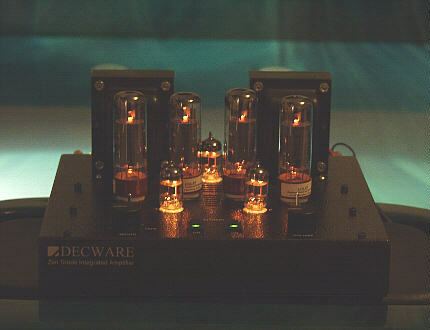 Hmm, the signature "Decware sound", with the added headroom.These new amps sound like a winner ! I have been trying to figure out why this was happening... and I think I may have figured it out. It is not the sub-sonics. When I listen with my eyes closed my eyes rapidly dart back and forth as I "focus" on intruments and sounds in the music. For some reason music with the lowest bass seems to have more depth, front to back. After a few hours of listening, I think I am suffering from "self induced motion sickness". This happens more rapidly with bass heavy music because my eyes are literally focusing near and far even while closed. As I focus on closer instruments and then on drums or percussion... this really makes me sick. What a relief that I am not being exposed to the 'death frequency'. Somewhere up in the post it was mentioned that audio is not a contact sport. Anyone who has attended the hornfest knows that it can be. My forehead still has a bit of bannana pulp shrapnel. This was caused by a rather uninhibited controller of the volume. The snap crackle and pop of a rather well worn in pressing of dreamboat annie was to be the catalyst in this horrific scene. One deep groove too many and WHAM!! I still have the dent in my forehead, a reminder of just how brutal audio can be. Well; anyone one of you that invested in the new mono's is still welcome to post a few impressions.